Prepare cake according to box directions, stirring in lime peel after cake is mixed. Bake as directed at 350 degrees in 2 9-inch round pans. Cool in pan, on wire rack for 10 minutes. Cool completely after removing from pan, at least 1 hour. When cool, place 1 cake round on platter. Cut top with serrated knife, if needed, to make the top even. 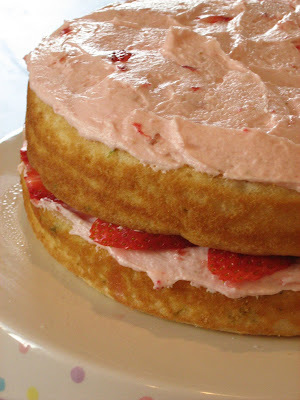 Spread a thick layer of Strawberry Buttercream on top, just to edges. Cover with thinly sliced strawberries. Place the other cake layer on top, upside down (you might also want to trim the top of this cake layer, so that it will fit better). Spread Buttercream on top, just to edges. In a medium bowl, beat butter with electric mixer on low speed about 30 seconds, to soften, then on high speed until fluffy. 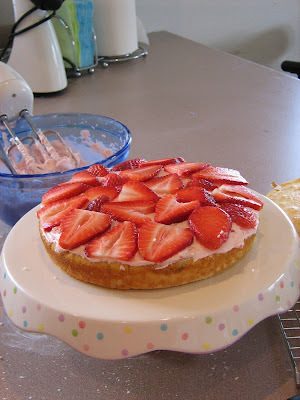 Add chopped strawberries and powdered sugar; beat on low speed until sugar is incorporated; increase speed to medium and beat until frosting is fluffy, stopping to add milk (until consistency is thin enough to spread, but still thick and creamy) and strawberry extract. I can't wait to try this cake!